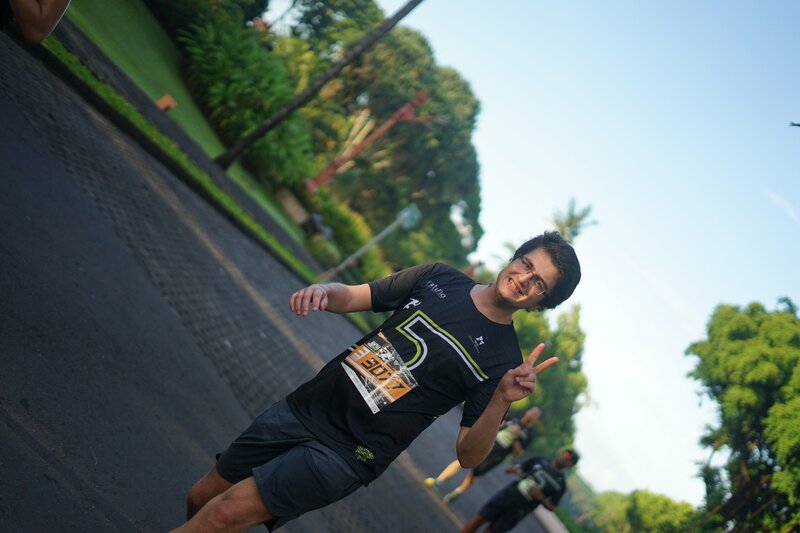 The story of my first ever race; a 3 hour run in Bali, Indonesia. Plus, a trip to a beautiful secluded beach. 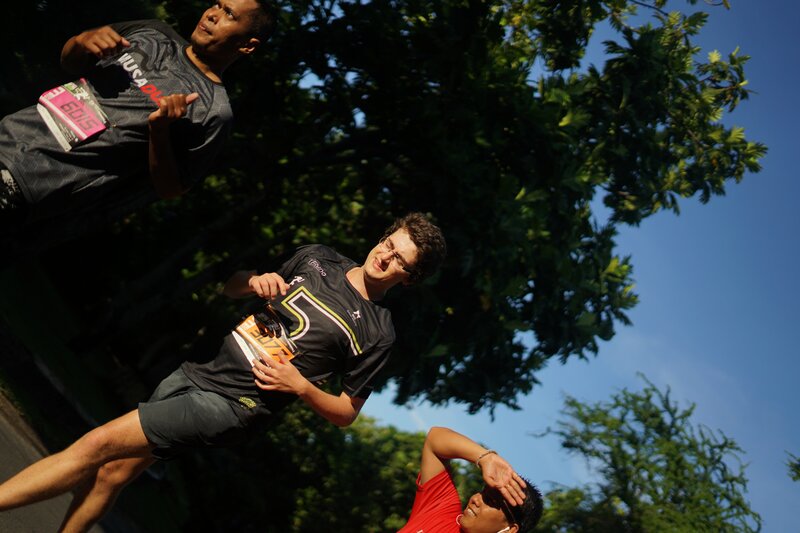 Run Till You Drop (RTYD) is a race taking place annually in Bali, Indonesia. The premise is that there is a track of a set length (eg: 2.2km), and runners have a certain amount of time to run as many laps as they can. 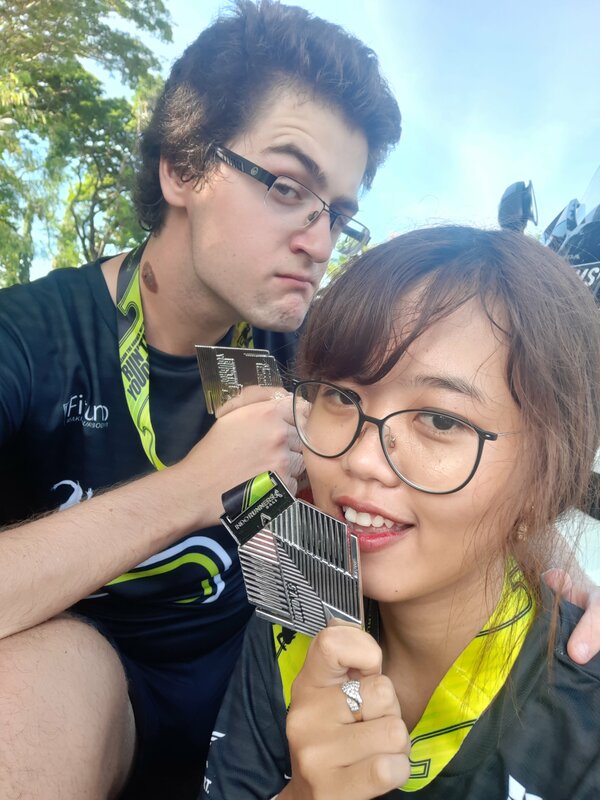 My Balinese girlfriend Ni was taking part in Run Till You Drop 5, taking place on March 31st 2019, and she asked me to participate too. I was originally going to do the 2 hour version of the race - the version Ni had applied to do - rather than the 3 hour version of the race. I was talking about the race with my friend Daniel, who said to me “What Would Goggins Do?” - in other words, he was challenging me to do the 3 hour race. 3 hours of running seemed like a difficult challenge, as I had never done anything like that before. But fine, Daniel, you win this time. I opted to do the 3 hours, which requires a minimum of 8 laps to win the medal. This would be my first race of any kind. If you want to skip to story and go straight to the results, click here. When you’re registering for the Run Till You Drop event, you must supply some information about your health, including your blood type. I didn’t know my blood type - neither did my parents - so I just filled in Type O, as I know that anyone can receive O type blood. The question seemed fairly flawed to me though, as the options were only A, AB, B, and O. No inclusion of positive or negative?! You can put any name you want on the bib. Naturally, I had Jetroid. 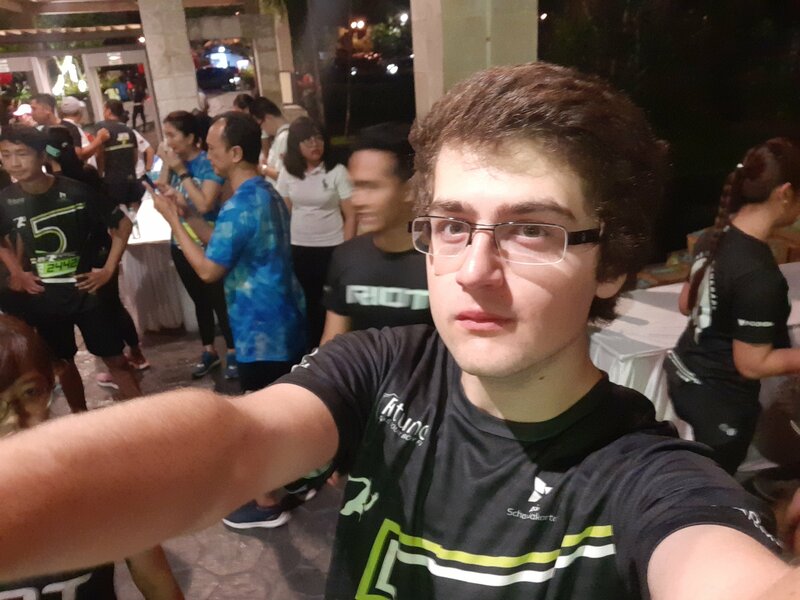 Two days before the event, we picked up our race pack from somewhere in Denpasar, where I got to meet some of Ni’s friends. The race pack was essentially just a bag full of advertising flyers, a running jersey, the race bib (mine was #3077), some multivitamin pills, and a coffee shot. Picking up our Race Pack. We’re making a ‘5’ shape with our hands because this is the 5th RTYD. I’m in a weird pose because I wasn’t wearing my own clothes and these ones were threatening to fall down. 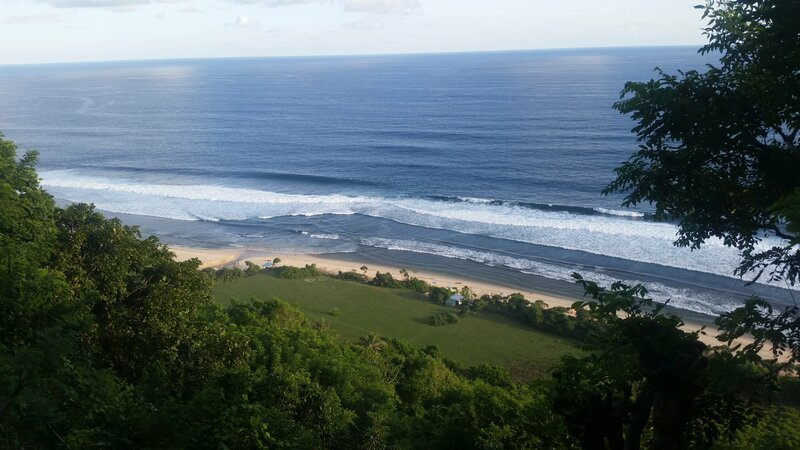 The race would be taking place in Nusa Dua - the far south east of Bali - 42km from where I was staying with Ni in Tabanan. Because Bali has such hot weather, the race was set to begin at 5:30AM, meaning it wouldn’t be feasible to travel there for the race. 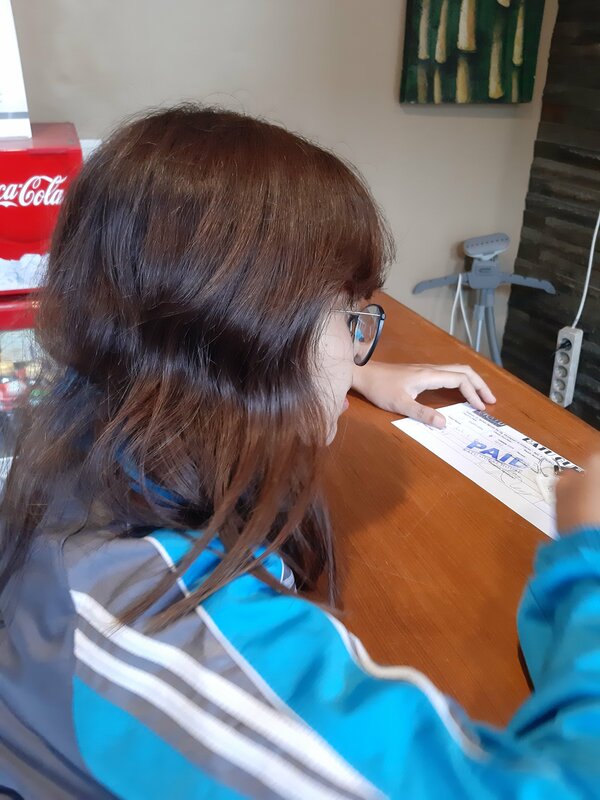 Instead, we booked a place in the Ratu Guest House through the Indonesian booking app Airy Rooms. The day before the race, after Ni had finished work, we travelled down to our room to check in. The room was quite nice and the place had a pool, though we didn’t have an opportunity to make use of it. Checking in to our room. We left the room at 4:30AM in the morning. Surprisingly, even this early in the morning, some of the Balinese locals are awake and doing things in their roadside marketplaces. Ni told me that her auntie wakes up at 2AM to set up her market stall in Tabanan. Huh, wow! The roads were pretty empty of cars and bikes though (relative to the daytime, anyway…), so we got to zip around fairly quickly. 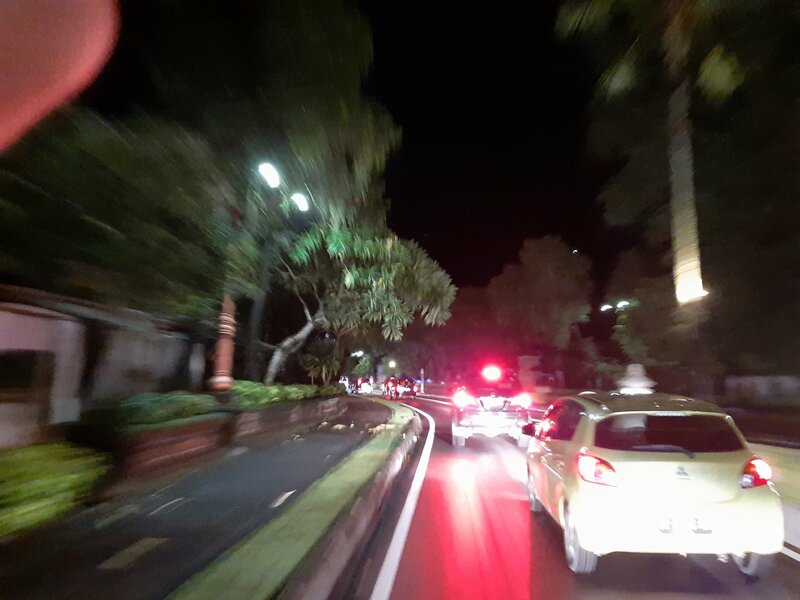 Bali is pretty cool at night - everything is really quiet and you can hear the crickets and the tokay geckos. By the time we arrived, the crowds of runners were already in full force. There were 596 individual runners for the race, plus 14 teams of relay runners - not to mention the staff and supporters! You can probably imagine the crowds! Part of the crowd of runners at the event. A stage had been set up where a man was giving out instructions. Unfortunately the instructions were in Indonesian so I couldn’t understand him, but it was okay because I knew the gist and he repeated any important points in English too. After he was done, all of the pacers came on to the stage and they started demonstrating different stretch positions, and all the runners copied them! Eventually it was time to prepare for the race. As there were over 600 runners, the starting line was quite packed - it took me almost a minute to get across the starting line after the event had officially started. 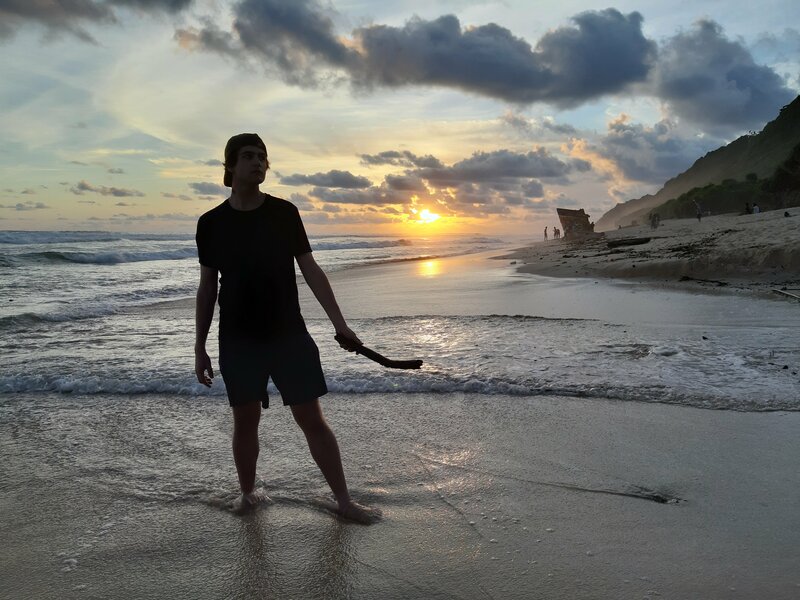 The sun rise is at 5:32AM at this time of year in Bali; the race started somewhere around 5:30AM, so the first lap was run in darkness. 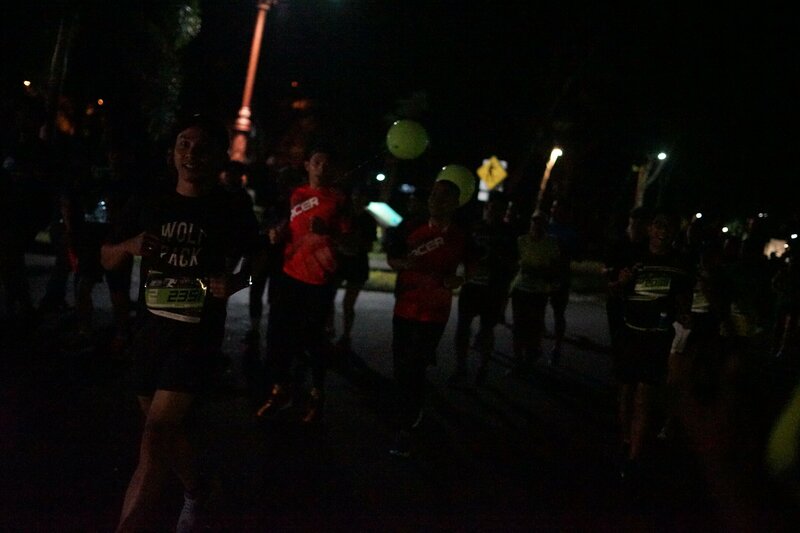 I had to rely on the light from the race marshals, passing motorbikes, and occasionally the other runners. The impression I got was that people were forming into groups because it was so dark. I followed along the 6min/km pacers for the first lap, and you can see that reflected in my split time. There were a few people running with the 6min/km pacers, one of whom was wearing a vest with the slogan “Once a ranger, always a ranger!”. I kept thinking in my mind “RANGERS LEAD THE WAY!”. Take me through the night; fall into the Darkside. After the first lap, I actually felt like I was running a little too slowly because there was a strange feeling in my shins, so I sped up slightly. 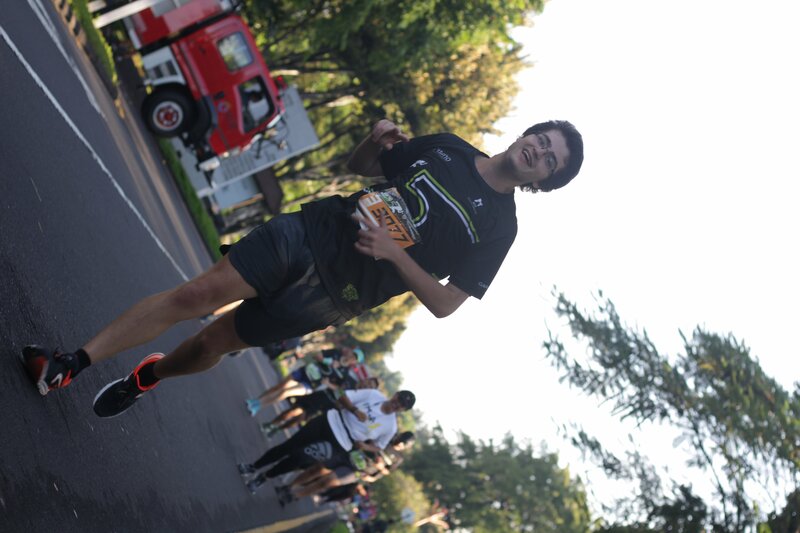 I still wanted to keep a slower pace because I knew I had a lot of race still to go. 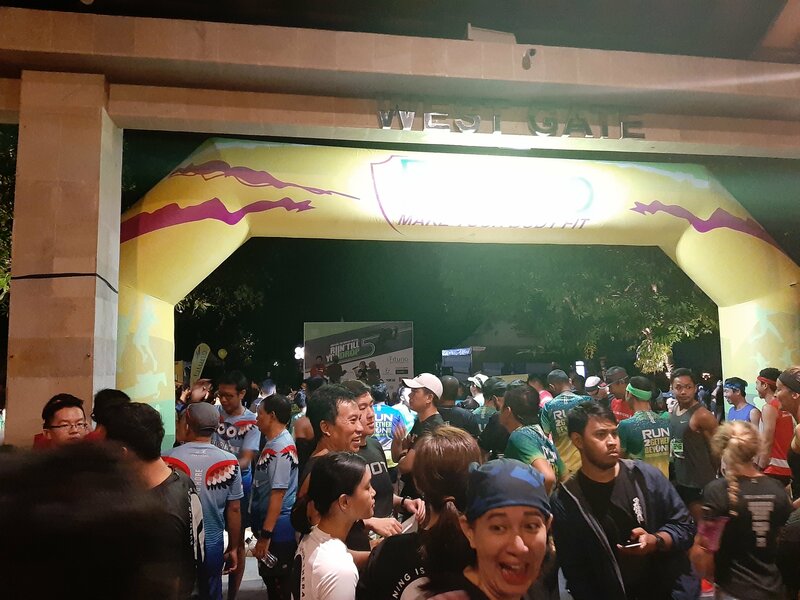 Half way through each lap, you run past a pair of girls at a checkpoint; one would shout out the runner bib number - ‘Tiga Nol Tujuh Tujuh’ in my case - and the other who wrote it down. I was actually a little worried that they might miss me, so I ran close to them and made sure to listen for my number. I’d always shout ‘Makasih!’ (Thank You!) to them and the other marshals; something I did habitually at Southampton Parkrun too. After every lap you reach an aid checkpoint, where you get the opportunity to drink a cup of water, Pocari Sweat, or eat a banana. Running sometime early in the race. Already sweating. Towards the end of my fourth loop, I lapped Ni, who was running at a slower pace with a group of her friends. I sang to her ‘Take me through the night; fall into the Darkside.’; lyrics from one of her favourite songs. She was surprised to learn I was close to finishing my fourth lap whilst she was finishing her third, but I wasn’t surprised; earlier in the week we had gone running together in a park by her house and I found that I would catch up to her after 3 and a bit loops. Ni running. She hates this gif. 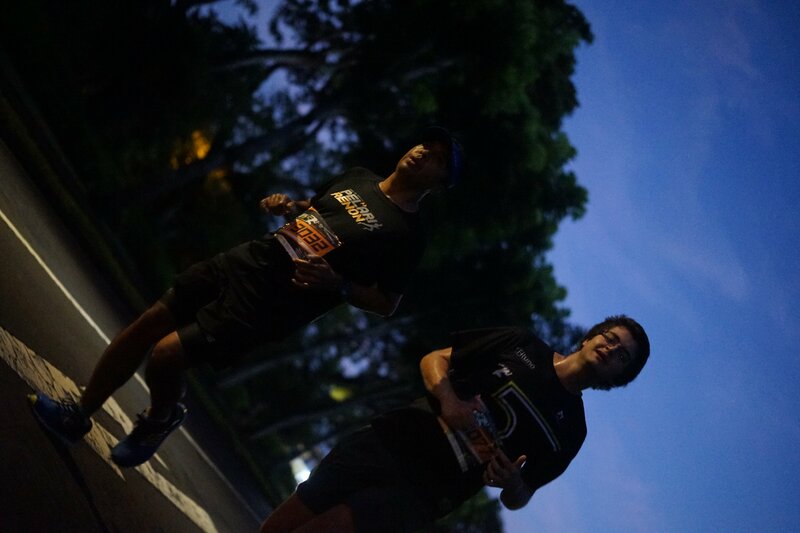 By the time I had finished my fifth lap at 6:30AM, I had run 11km - the minimum distance for runners who had chosen to do the 2 hour run duration - and was overheating massively and was beginning to get a headache. The sun had fully come up now and was heating the ground and air. My clothes were wet from sweat and felt tight and heavy. I didn’t know what to do to recover properly. I spent around a minute at the aid station drinking cup after cup of water and Pocari Sweat. I felt bad so walked a few hundred metres to cool down, before resuming at my jogging pace. This problem continued for the rest of the race. Probably taken moments before I shouted ‘Makasih!’. During my ninth lap, I started to feel quite tight in my stomach; I figured I probably needed to poop. After I reached the start/finish line, I asked a marshal to direct me to the toilet. There was some confusion and it seemed like nobody actually knew where the toilet was, until finally someone pointed me in the right direction. There was a small queue for the toilet - the 2 hour runners had just finished - but then when I actually got my turn, I found that I couldn’t go! Argh! I used the opportunity to use the cold water of the sink to cool my temperature down so that I could go strong for any remaining laps I do. Though obviously my 10th lap time looks really bad because of the time usage of going to the bathroom! Running to approach the finish line for one of my middle laps. Running to approach the finish line for a different one of my middle laps. By the start time of my 11th lap, I had run (with a little walking…) over 22km, slightly further than a half marathon. This was further than I had ever ran before by over 7km. More than that, I hadn’t really been training properly since I left Chiang Mai two months ago, so hadn’t been in peak fitness. The combination of these factors meant that I was exhausted so decided that I would walk my 11th lap. Comment on a picture of me that was uploaded to Facebook. Somewhere midway into the lap, the 7 minute pacers - running alone by now - caught up to me and began to pass me. I decided I would run with them, and let them carry me across the finish line. ‘Kami Pergi!’ (We go!) I told them in broken Indonesian, and they said (in English) “Yes brother, let’s run!”. Ironically, as painful as my thighs had felt before the 7 minute pacers encountered me, I kept wanting to run faster than them; I knew that I can normally sustain a faster speed comfortably, and it felt weird to be running slower. The temptation to speed up was especially hard when the 6 minute pacers passed us a kilometre later, but I decided that it would be rude to leave the 7 minute pacers for the 6 minute pacers. The sun was very bright along this stretch of road (1/3 of the way through the lap) towards the end of the race. 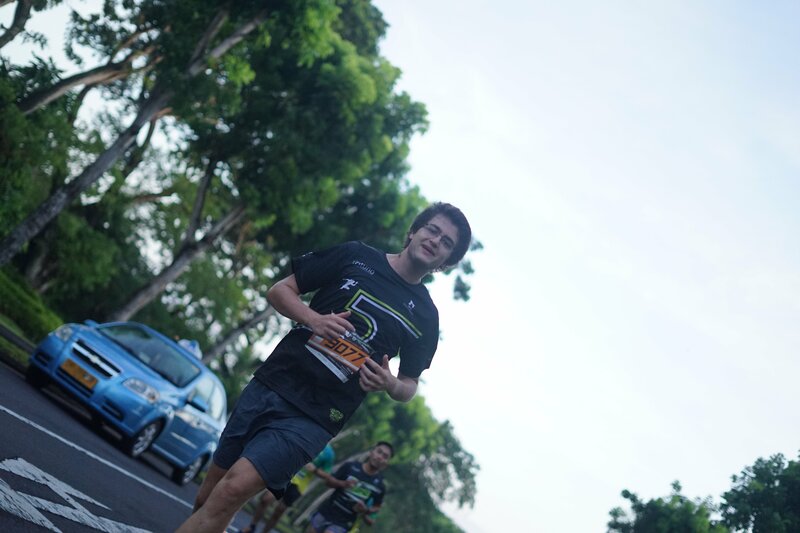 200m from the finish line, I said ‘Makasih, Sampai Jumpa!’ to the 7 minute pacers and went as fast as I could to the finish line, finishing my 11th lap with just over 5 minutes to go until the final cutoff. Inside the finishing line, Ni was waiting for me, and she didn’t believe me when I told her that I had done a full 11 laps; she had only done 6. Posing by the side of the road. I managed to run a total of 11 laps in 2 hours, 53 minutes and 45 seconds. This was a total distance of 24.2km; almost 10km more than my previous best. I finished in the 38th position for the 3 hour category; pretty average considering there were 81 runners for that category! 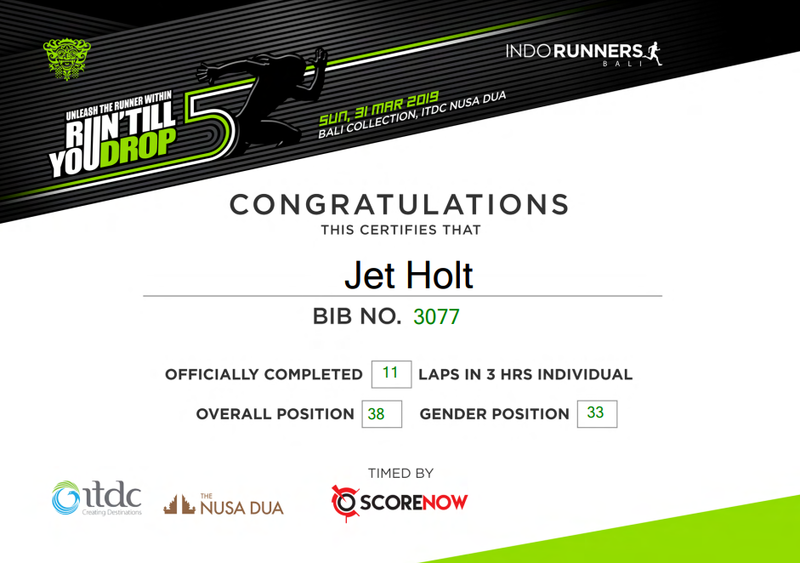 Online certificate for completing the race. Overall, I’m very happy with my performance. I didn’t beat any of my records for speeds, but I went further than I have gone before. 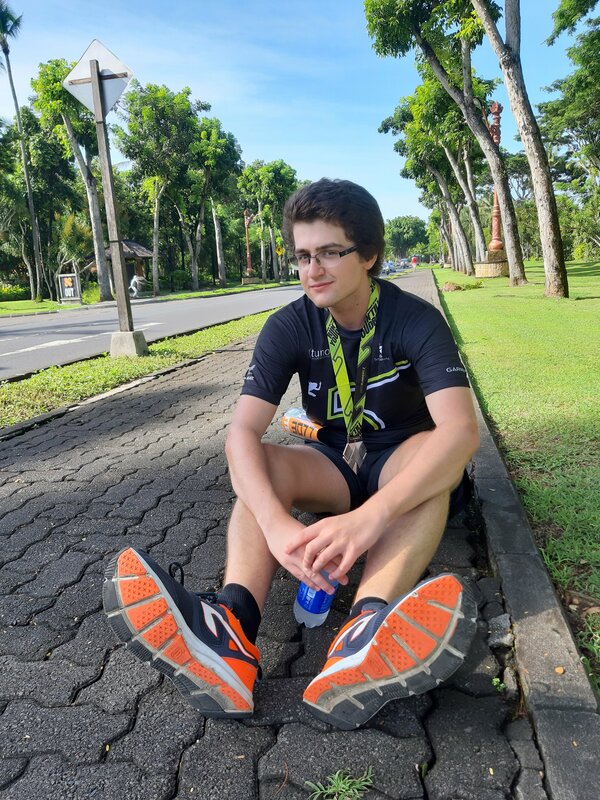 I’m also happy because I didn’t quit when the going got painful; despite the name of the race, you can stop as soon as you have done the minimum distance. I pushed (safely) and continued on to reach a distance I can be proud of. 1: Difficult to get out of the starting pit because of the crowd. 2: Was overheating massively by now, slowed to keep cool. Affected the rest of the run. 3: Went to the toilet at the end of lap 9, affecting the split time of this lap. 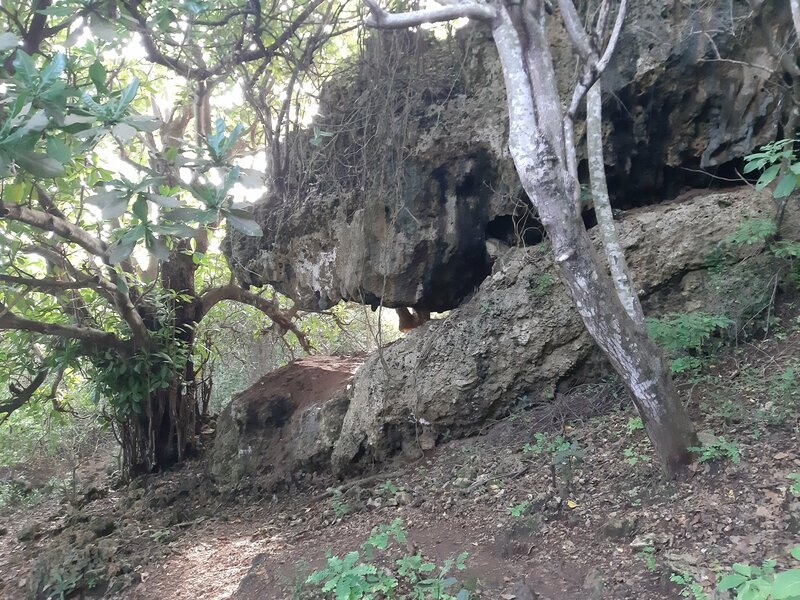 After everything, we took a nap at our room and then took a trip to Nyang Nyang Beach, an isolated beach that you have to climb down a rocky, slope-y, step-y path to reach. Great, more exercise! My legs hurt! I don’t know if there are other paths you can take, but we climbed down from Villa Solymar. 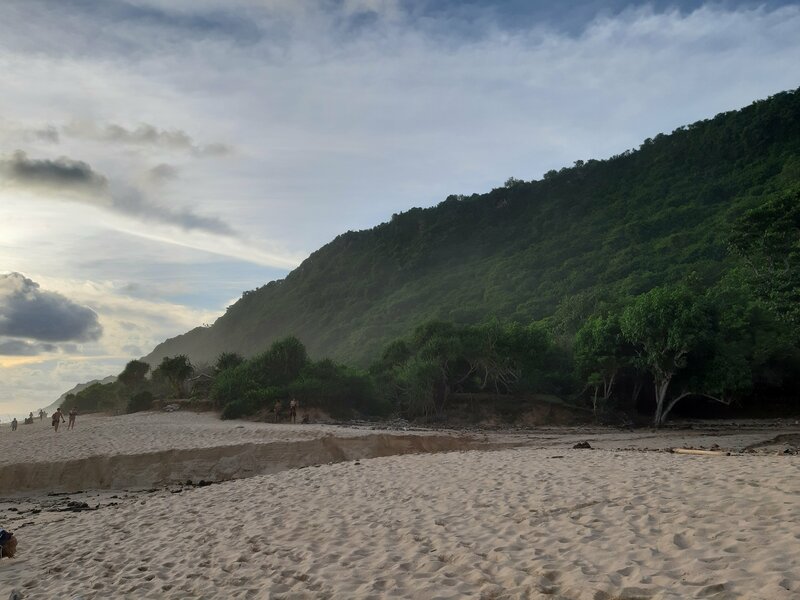 This was a very beautiful beach; pristine white sands, dark blue waters, serene wooded cliffs, shipwrecks, small walls made from fossil coral rocks. We took lots of beautiful photos. There were very few visitors here. You step around a corner and this view comes out from behind the trees. Jawdropping. 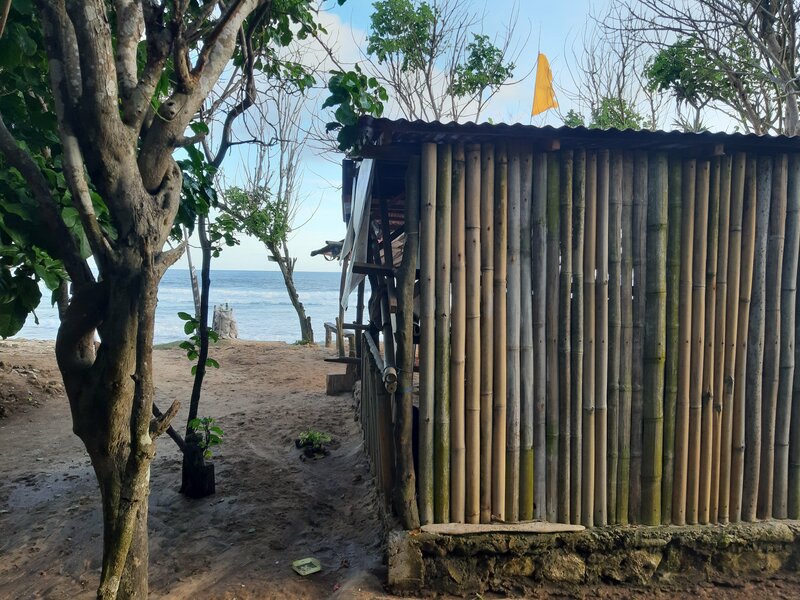 Little bamboo shack by the beach. The locals sell food and drinks from here. There were a couple more on the climb, too. 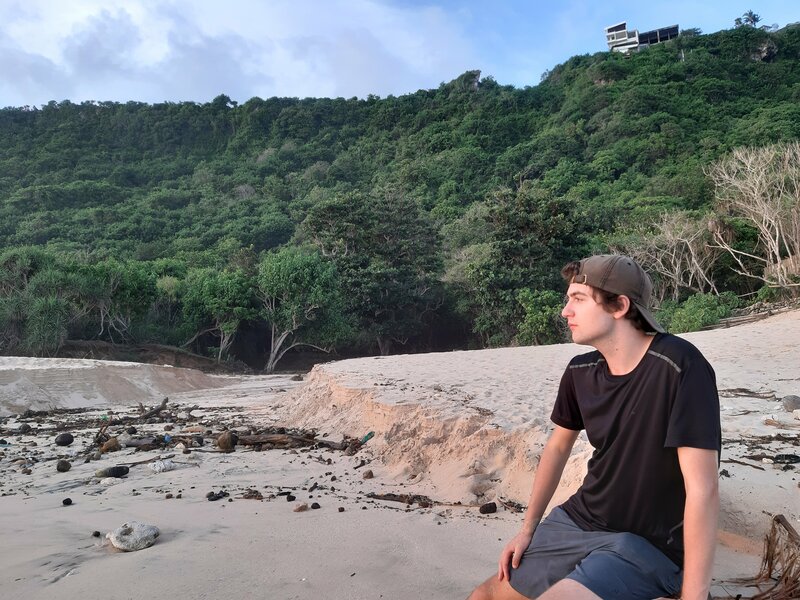 A beautiful jungle hill sits behind the beach. I love the slight fog. Playing with a driftwood stick. Part of a rusty shipwreck sits behind - a Brit with a drone offered to film me climbing around on it, but it looked sharp and dangerous so I refused him. P.S. 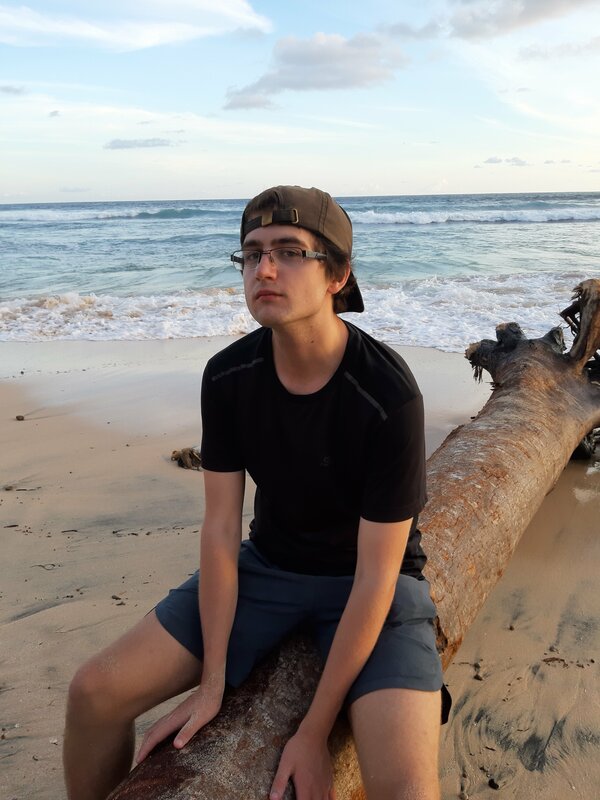 I'm late to the party, but I recently got a twitter account that you can follow here.